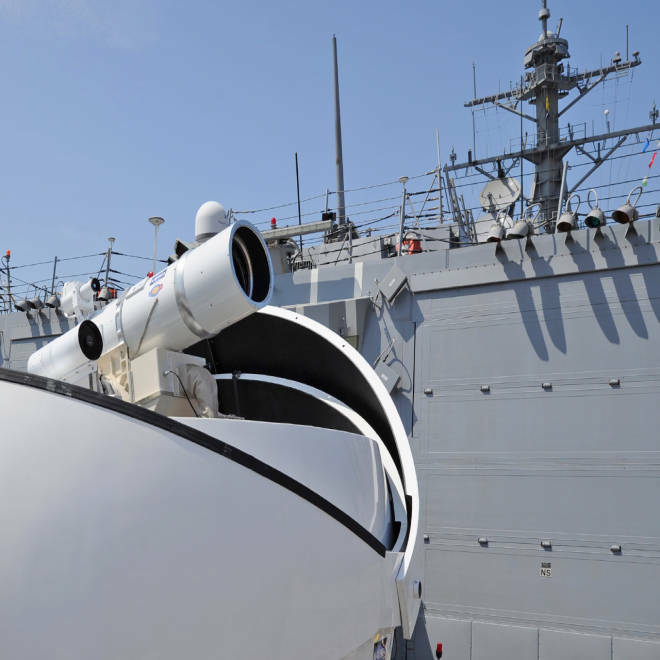 The Laser Weapon System (LaWS) temporarily installed aboard the guided-missile destroyer USS Dewey. The U.S. Navy announced Monday that it is preparing to deploy a new weapon that can disable a hostile boat and even destroy a surveillance drone overhead — all without dispensing any expensive ammunition. The Navy released this video showing its new laser weapons system during an exercise at sea. The laser is capable of destroying planes, drones and boats. It is the Navy's Laser Weapons System (LaWS), a laser mounted on a ship that is so strong it can ignite a drone, sending it crashing and burning to earth in mere moments. The USS Ponce, an amphibious transport docking ship, will be the first Navy vessel to deploy with the LaWS, officials announced Monday. The new laser will be installed on the Ponce over the next year and operational in summer 2014. The Ponce is now based in the Fifth Fleet area, which covers the Persian Gulf and the Horn of Africa. The LaWS will initially be used to combat small boats that pose a threat to larger U.S. Navy vessels — much like the small Iranian fast boats that pester U.S. ships in the Persian Gulf and Strait of Hormuz. The Navy plans to use the laser to combat missiles and other threats from the air, to ward off threatening ships and to stop other foreign threats. Eventually the system will be able to stop an incoming missile. While making the announcement in Maryland today, Chief of Naval Operations Admiral Jonathan Greenert praised the LaWS ability to take out targets at a tiny fraction of the cost of other conventional weapons. He claimed that the LaWS can shoot down a small drone for about $1 worth of electricity and, once the laser is operational, it should be able to replace a Gatling gun, whose rounds can cost several thousand dollars each. A defense official also stressed that the laser will not have full capability to take down a larger target for a decade or so. Despite speculation the laser is deploying to the Fifth Fleet to warn Iran, a U.S. military official says that the real reason it's going to that region is that it is "the hardest environment" the Navy has available to test the new system.